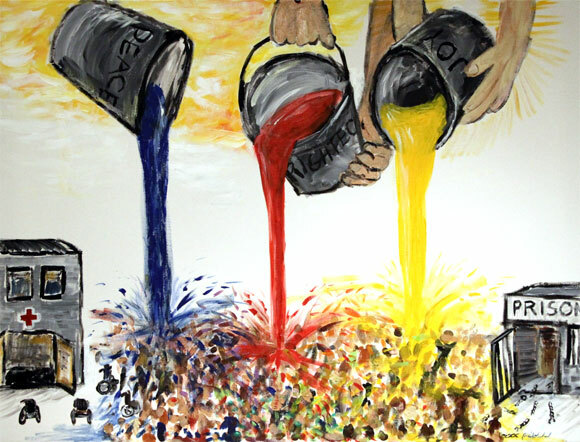 Painted spontaneously during worship at Convergence Conference 2013. Righteousness, peace, and joy are being poured out by God. The Trinity is represented, with Jesus pouring out the righteousness, Father pouring out joy, and Holy Spirit pouring out peace. These three elements of the kingdom of God are represented here by the primary colors; red, yellow, and blue. Red is righteousness, yellow is joy, and blue is peace. As it is poured upon the people, they are celebrating, and basically having a “paint war” party. They’re throwing the colors onto each other, and the three primary colors mix together to form the full spectrum. People are being set free from all kinds of oppression. The prison door is open wide, and broken chains are on the ground. The captives have been set free. The hospital door is also open, and empty wheelchairs are strewn about, their former owners having been healed and joined the party.